Sales this beads kombologion (komboloi) - my Internetshop. Material is partly adopted of the "Wikipedia" -to the modern electronic encyclopaedia (Russia). Translation author this website. Kombologion beads - special man beads, for today widely widespread in Greece. Usually used not for counting out of prayers, as beads for christians, moslems or buddhists, and for meditation and intricate throwing of kombologion (komboloi) beads in hands. Word beads for man "kombologion (komboloi)" originates from a word "kombos" (knot, bead, knuckle - almost as a ship's "galley" is a "kitchen, apartment for preparation of food" on a ship) and suffix "loui". The most credible version says of that Greek adopted kombologion (komboloi) at turk. Kombologion man beads got distribution in Greece among the wide layers of population as early as middle ages sew on eras. A next-of-kin is beads man's kombologion (komboloi), widespread on Cyprus - it "peglerie". It is a 10-centimetre string, not formative a circle, with marbles balls beaded on it. History of this object carries a very criminal tint, as peglerie appeared in Greek prisons and from there "hurried" together with by prisoners on point-of-sale and piratic courts in holds - closer to the ship's galley and storages with food. Originally made clever fellows from Greek olive stone, and in default of them - from мякиша of bread. Panary crumb with addition of saliva and ash from burned out a few packs of cigarettes, hesitated fingers until did not become black. Turning out lumps were pricked a match and thread, on either side forming the special dents for fingers. After drying out marbles balls become hard, as stone. The inflicted patterns served as not only a jewelry but also were expression special secret - "haptic" - language of the criminal world. And peglerie were a pocket "training instrument" in exercises for adroitness of hands - especially thieves. It is not beads and even not usual all christian or buddhistic beads, where distance between beads is extremely insignificant (there is not a free filament). 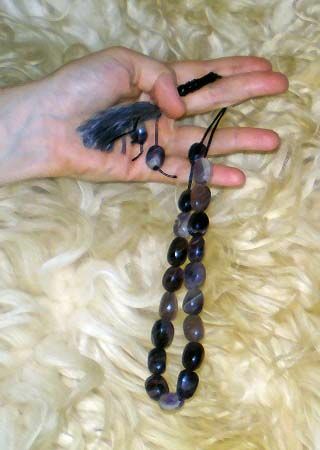 To distinguish kombologion (komboloi) of the great number of analogues which twist in hands, very simply for knowing: size cord or chainlets of kombologion (komboloi) almost in two times anymore lengths beaded on it stone. 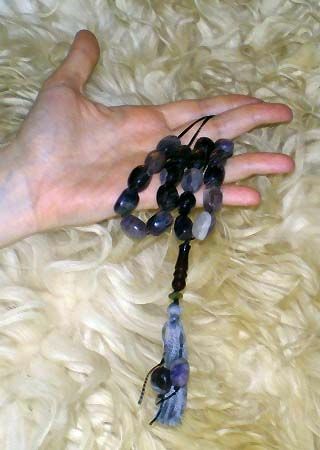 The ends of filament united together usually adorn oneself "fantasy" by a tail, and amount stone varied usually from (11)13-19 to 23 (about 20 things). With a beads in the ring of kombologion (komboloi) brings together similar original appearance - it about 20 stone, beaded on a thick durable thread. But, unlike a rosary, kombologion (komboloi) usually is not used for counting out of prayers is an instrument for training of fingers of hands and meditation. In addition, kombologion (komboloi) man's beads is character of courageousness and necessary attribute of tough guy, mangase - "steep" (another criminal tint of these rosary, be as the attribute of "kingpin", "main squeeze", "big fish man"). Kombologion man's beads can be thrown in hands in a number of different methods. 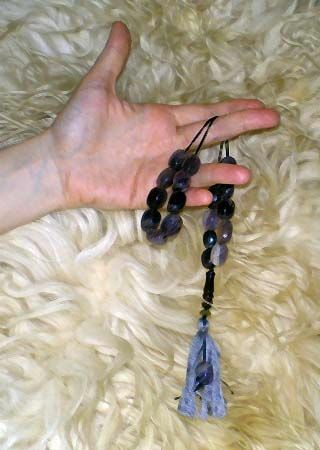 For example, catching a thread in the middle by two fingers, it is possible to twist the half of beads about the axis, while other half beads with beads reposes in a palm. There is other, more difficult method, when beads are divided in half, a filament is skipped between a middle and indicatory finger, and the halves of rosary are quickly thrown, well switching places. Kombologion man's beads is made out of great number of the most different materials, including very valuable. Among materials which are used for their making is amber, bone, shells, mountain rock crystal, horn, natural modern resin, obsidian. Collection kombologion (komboloi) man's beads is made from coral, gemstones color jewels stones and semi-precious stone. There is even Museum of beads man's kombologion (komboloi) in Greek city Navplion (history and contemporaneity). For men (macho, tough guy, mangase) it is comfortable original fun which always near at hand, sedative from an anxiety and breaking a secret on will emotions, jewelry, demonstrating welfare and taste of proprietor, talisman, guarding from misfortunes and simply habit from which hardness to renounce. And till today the unhurried sorting out of stone is a not out-of-date method of counting out of time for Greek. Becomings inalienable part of national look of Greece of kombologion (komboloi) man's beads lost certain religious sense (by the way, secret "pocket" character of Greek god of thieves and trade of Hermes - Mercury), being character of patriarchal courageousness. In world and scientific practice material for a classic rosary and kombologion (komboloi) man's beads gets out in connection with one or another his aesthetic and haptic properties, cell-colors and visual (scientific theory) influence on the brain of man. Beads from a juniper, red coral and dark blue лазурита distract from wicked ideas and actively remove injuriousness influences on a brain and psyche of man by active contemplation (meditations). A violet amethyst - valuable stone of catholic priests and catholic church is popular. Strong-smelling beads from sandal wood, beads of mountain rock crystal and white pearls serve for calming of nerves. Silver, copper and succinic - for active energetic full meditation and contemplation. But even usual inexpensive beads from inexpensive semiprecious stone and carpentry materials able to create visual wonders for the tired psyche. Not use for a rosary and beads kombologion (komboloi) flowed, especially hollow - it traumatic is a plastic and artificial stone much more safe-health !!! Stone on the rosary of kombologion (komboloi) must not be sharp, fragile, cuttings, soluble, too soft, crumbling, and main - poisonous and radio-active, that is categorically forbidden in principle. For kombologion (komboloi) any stone are not used in cutting and with facets - they have sharp cuttings edges and corners (kombologion (komboloi) not licensed) - kombologion (komboloi) is used for a rapid and speed rotation !!! It is not needed to use druse crystals, fragile fossil amber, very crumbling and difficultly arranged natural stone, geode, fragile goldish brazil, flimsy and sheaf-like tourmaline, soft fossil гагат, fragile fluorite, any garnet (they crack from shots), opals of any genesis, apatite, flimsy diamonds (especially from river mineral deposits), demantoide and emeralds, black quartz (morione), citrine and quartz, flying away on cleavage topazs, soft marble ball and flimsy shell rock with fragments of fossil shells. For beads kombologion (komboloi) the durable befit and hard enough agates, cornelians, colourless quartzs, nephrite (jade) technical, amethysts, separate varieties of inexpensive jasper and similar durable mountain rocks. In kombologion (komboloi) major description is real use of stone it is durability and uncostliness. If a stone is spoiled cleavage or sharp edges - he can be simply knocked out from by a kombologion (komboloi) hammer. Use more than 50 methods of turning beads, executable with taken spirit by speed, and only the protracted training is arrive at this effect. Large beads from heavy gemstones color stones stone at a speed acceleration can have an effect of speed brass knuckle. However much the few truly owns skill of speed rotation beads - they are usually sorted out in hands - both throwing marbles balls here and there or winding them on fingers. On a photo are elements of handling the rosary of kombologion (komboloi) beads in execution an author Julia V. Kaftanova (Kharkov, Ukraine, author K.305). The Chinese healers do not doubt that the massage of brushes and fingers of hands helps to be delivered of the row of illnesses. Therefore for a prophylaxis and making healthy it is possible to massage a rosary active areas, located on hands and feet. For example, the massage of finger-tips will help to be actively delivered from a chronic cold and head pain. In addition, the reflexotherapy body points of urgent reanimation of the peripheral nervous system and renewal of base nerve-centres of general life-support of man are there located exactly. And concentrated and calm down it is possible, roaring stone on the center of palm - an area is responsible for the peripheral nervous system is be as traditional exercise of Medical stone therapeutics "throwing up of ball in a palm". Today, in modern computer-controlled and Internet's XXI age, this rarest variant of rosary is especially popular for drivers heavy cars and automobiles, accomplishing distant journeys and transfers road (especially foreign). Ukraine gives a preference the dear and valuable rocks of semiprecious stone, which must be safe, unpoisonous, unradio-active and on possibility legally. To the people, to workings at the computer, stenographers, musicians and pianists, must prescribe these beads for strengthening of muscles of joints, warning of traumas and professional diseases. For this purpose it is necessary to massage the racemes of hands is good polished ROUNDED natural gemstones color stones and semiprecious stone, settled in contact Medical stone therapeutics, in direction of the tags of fingers to the wrist. Size without a brush - 290 mm. 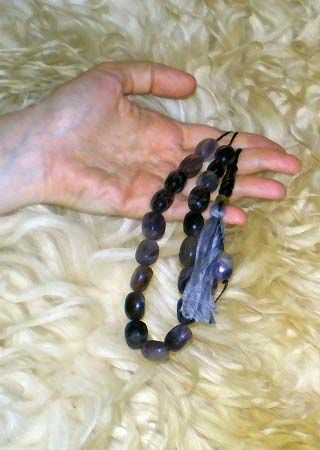 Used as a hand trainer for meditation and contemplation. Rare the goldish Brazilian stone crystal, cylinders. Size is beads without a brush - 185 mm. Small kombologion (komboloi). Width of stone - 12-15 mm. Size is beads without a brush - 170 mm. Addition. "Rosary, men's beads" - practically the Russian word, possibly, is left from Central Asia and Kyrgyzstan (Kirghizia, conversations of Chingiz-khan, Fergana, Khaydarkan is the CIS). It is formed from a word "ch't'ka" ("chetka" are "directives", "ch'sti" - to "count", "consider") . Encyclopaedic comment: marbles and beads for man of comfortable (by ergonomics) form for a rosary (men's beads) are made out of stone, bone (bull), wood, amber and other suitable for these aims of durable, not fighting and beautiful material. It can also be the chainlet special form, look like beads. At pravoslavnykh (orthodox christians, Zagorsk, Moscow region, Russia, CIS) and catholics (Vatican - the European city which is located on territory of modern Italy is inferior Spanish Coronet, way "From Varangian in the Greeks") to the rosary (men's beads) an icon (image of saint) or cross is sometimes suspended. In an orthodox church a rosary (men's beads) with appearances (images of saints are in a church stilizovannom kind) is often used by monks and nuns. A rosary (men's beads, kombologion) was entered in IV century A.D. by the founder of one of the first christian monasteries of Lord St. Pachomius the Great, St. Pachomius of Egypt (die 347, May 9). In Russia (CIS) a rosary (men's beads) widely was entered in everyday life in XIV century A.D. by the founder of one of the first christian monasteries Hegumen Lord Saint St. Sergius Radonezh, the Miracle-worker of all Russia, Great God Orthodox, "Great God Hermit" (1315-1392 A.D., monastery of the Troice-Sergieva lavra, Trinity lavra of St. Sergius, the monastery of the Most Holy Trinity at Sergiev-Posad - is old history, Zagorsk, Moscow Suburb outskirts, central European part of Russia, CIS) for competent and scientific monks (in Russia CIS at monasteries until now teach a modern deed, to read and write - library name of the V.I. Lenin) which must accomplish the certain number of prayers and bows daily. Blessed on a battle Dmitry (Demetrius) Donskoy. Rosary (men's beads, Man's beads) is widely widespread adaptation for the medical gymnastics of hands and treatment of racemes of hands (rehabilitations after wounds and battles), for counting out of the read prayers (on a lake is Rostov Great, Kremlin, "Gold Ring of Russia", CIS), perfect bows (Ivan IV the Terrible, Moscow, Kremlin, Russia, CIS) and similar religious actions, and also for moslems as a durable lace with knots or beaded on him 99+1 beads or with 99+1 knots and part on three equal parts (the amount of beads and knots corresponds the number of "wonderful matters of Allah"). Also hemp or other lace with knots (large knots, Russia, CIS Pereslavl-Zalessky cloister, are a "knot letter") or beads (East tradition is China, nephrite, jade rosary men's beads, "Great China Silk Way"), office worker for the account of the read prayers (prayer) of beads; kombologion; (in Western Christianity, especially for the catholics of Vatican and Spain, Europe) rosary; (a variant is beads for catholics, consisting of 55 (sometimes from 59) grains of chaplet; for the moslems of subha; for moslems with 99+1 beads comboloio grain (beads) - bead to read prayer on a rosary (men's beads) - to count (say, tell, bid) one's beads. A rosary (men's beads) is widely widespread also for buddhists and moslems (tradition came easterly, China, where a "tsar of stone" is a green not toxic and not radio-active nephrite jade). Moslems also use for a rosary (men's beads) a quartz-hairstone (white mountain rock crystal quartz with a jetstone by a black schorl tourmaline) is a "beard of Prophet of Mahomet". Incomplete rosary (men's beads) on a long cord with incomplete (less usual 33, usually from 19 to 23) amount of beads - a prototype is beads "greek komboloi (man's kombologion)", when at Lord Pliny Senior an incomplete rosary from natural amber cracked and burned up at a fire and explosion of volcano Vesuvius in Europe (a visit of bath-house is therms), "Death Date of Pompeii", Italy (Europe). Explosion of volcano Vesuvius, advent of wave-killer and trip a tsunami on Europe and near Africa of Lord Pliny Senior. A Greek rosary kombologion beads is Greek-Roman Catholic traditions of the Ukraine, CIS - on remote An athos in Greece, peninsula of Ayon-Oros, north-eastern coast, Aegean sea and channel is Dardanelles ("Simpligadii"), to the south of Bulgaria and Europe, before included in the Black sea (Crimea, Ukraine). From the Greek rosary beads of komboloi (kombologion) a modern church censer happened partly. It is a metallic vessel with a lid, hanging on a chainlet, in which incense voskurivaetsya on conflagrant coals - as a prototype a vessel arrived from Kirghizia, Middle Asia, CIS (Fergana, Khaydarkan). Loosening in a hand incensed, it is possible to diffuse smoke and smell of the not narcotic aromatizers smoked in him, usually amber and incense - at execution of religious ceremonies. Fragrance, aroma, perfume for a censer is India (south of Asia). It is also possible a censer effectively to drive away mosquitoes. Greek Mountain Athos, 2033 m - one of the high-honoured places of east Orthodox Church Pravoslavniy of the Greek-Roman Catholic world, is on east extremity of peninsula of Khalkidiki, on the northeast of Greece, center of orthodox Greek-Roman Catholic monkhood (settlement of believers from Ukraine), where about 20 monasteries are concentrated. In X century A.D. it one of the first monasteries abbey of Greek-Roman Catholic (Ukraine, CIS) - Christianity friary Laurel of Saint Afanasiy, is under partial jurisdiction of Constantinople, Byzantine Empire (By Pontiff Lord Vatican, the Patriarch of Rome Universal Church) patriarchate, the Holy Mt. Athos, mount Athos. Ukraine is religious atheists, drivings out in religious and other the pilgrimage in Ukraine and abroad (a mountain is Athos - to the south of the Ukraine, by a Black sea). Prayer, grace (molitva). Laudatory, testimonial or pleading address of priest or layman to God (addressed to God, the Lord), our Lady or saints. Address to God, to by a saint with a request about sending of blessing and disgust wicked, containing gratitude, laudation. Set phototypograph pronouncing a priest, believer or by persons interested at an address to God, to by a saint. Prayer is necessary part of religious cult, obligatory attribute of ceremonies, divine services or church holidays. It can be private (domestic) and public (temple). The most ancient prayers are fixed in Israel Manuscripts of the Dead sea is the state Israel, nationality is jewries (hebrews), book of "Torus" (Pentateuch of the Israel, the Book of the Law of Moses, which every year is read by jewries). Prayers were written also in Latin, Greek language and additionally translated from a hebrew, and then translated into the Church Slavonic (cerkovno-slavyanskiy) and modern Russian language. There are variants and on other languages ("I-dzin", China, South-East Asia). Horologion (molitvoslove, chasoslove in the lavra Christian monastire). Book of God Hours. Orthodox God Christianity church book, containing the texts of canticles and prayers for daily divine worships, urgent by "hours". Church-liturgical book, containing psalms, prayers, canticles and other texts of "day's" circle of divine service, and also texts often used molitvoslove - the horologium, the Horologion, the hour book, the Book of Lord Hours. A horologion is a book, which plugs in itself psalms, prayers, canticles and other texts of day's circle of divine service (except for the texts of liturgy, collected in ordinal book). A horologion targets at church readers and singing (even in Ukraine sing in choir quire), however much he serves as also a book for reading at teaching a language. Handling a rosary (men's beads) must be exact, it is desirable not to drop them, can crack or broken up beads, stone or torn string, some of the stone can be lost. A rosary (men's beads) is held in a hand (long - in 2-3 turns), wind on a brush or carry like beads on a neck. Komboloi (man's kombologion) could be formed as the special kind is beads as a feature of the masculine handling stone - part of stone from beads, bangles or rosary can crack, stone knocked out a hammer from jeweller good, an original masculine rosary (men's beads) turned out as a result - komboloi (kombologion), with long tail of the inset string. Them it is also better not to drop and not break up. Masters usually a rosary (men's beads, kombologion) gather collect anew and repair beads. The master of the real website and internetshop is specialized in sphere of marketing and making by hand from accessible and rare, and also individually neat materials of man's rosary beads of various styles and forms, including in one copy, under an order and exclusive - from present at disposal of the author of jeweller, gemstones color stones and semi-precious stones raw material. It is a traditional christian beads - 33, 66+1 and 99+1 beads, buddhistic traditions - 18, 21, 27, 36, 54, 108 beads for a beads for meditation, traditional Chinese I-dzin is beads are 64 beads, Greek kombologion (komboloi) - from 12, 15 and 19 to 23 beads and other variants (including European tradition - with any amount number of the beads) at will of the Customer. Stone are safe-health and neat as material for a rosary for man, subha, mussulmanic, comboloio beads.